I have been a SC licensed midwife apprentice for almost a year and started attending midwifery school last fall. If you know me, you know this has been a dream for many many years, and well sometimes it still feels like one, as the journey to becoming a midwife is not a short one. I am a doula, and never one who likes to wait too long, not out of fear, but because I am entrusted to make sure I communicate with my client’s provider and that they feel safe when they deliver their baby. But precipitous births happen, such is the story here. So this is my story, not the Mama’s, I’m pretty sure she’s got one of her own! The photographer is linked above for her version. This story is not the story I thought I’d have to tell. The one in my head was still in the future and included my preceptor. It involved a straightforward “four-handed catch, “ meaning she assisted, but we’d call it my first delivery. It was possibly an uneventful story, one I’d probably file away, the first many thereafter, quiet, sweet, cherished of course, but not monumental. I could run off on rabbit trails about how I’d been having a niggling feeling about an accidental catch, or that I was grumpy and sort of PMSing that night, so I drove alone, music blaring, cathartic tears streaming as I headed 40 minutes west to this Mama’s birth. I’d even worn my worst birth clothes, warning the photographer to neglect me in photos, but those things are just asides. God was working on me and I was unaware of His strong arm tactics. He’d been addressing me for a weeks, as my heart had been doubtful of late. Twice during mass I felt Him reminding me to focus on what He had called me to do. Do I begin with the last text I sent? Just 10 minutes before? Yes. I’d finished setting up which always calms me and makes me happy, chatted a few minute with her birth team and texted my preceptor who was bringing the tub that I wasn't sure there’d be time. I chuckled as I walked away from the phone towards the bathroom where Mama labored. My text contained a typo that at first glance would appear very Southern, I thought she’d chide me later because we’re both long ago northern girls who’d never say bowl, for boil. I said “Well if she’s coming that fast everything will be fine.” That’s what Carrie always says. I asked her to stand, mindful that a slippery baby on the toilet was not going work, lean over and grab the bar if she needed too. I called for a towel and gloves. At once, her doula, the photographer, and her husband were at the door of the tiny bathroom we were in. I’d knelt and as she pushed I was looking up, just a second to puzzle at the head I saw which seemed strange in color, but the second was gone. The bottom of her baby’s foot stared flat at me, a spring ready to kick, the smooth flat arch and delicate toes, begging to make a footprint. It seemed forever then, but it might have been seconds. I wondered if anyone else over my shoulder had seen. Could I keep this a secret? Could I stop it? Was it really happening? The first baby to slide into my hands was backwards? What omen was this? What joke?! 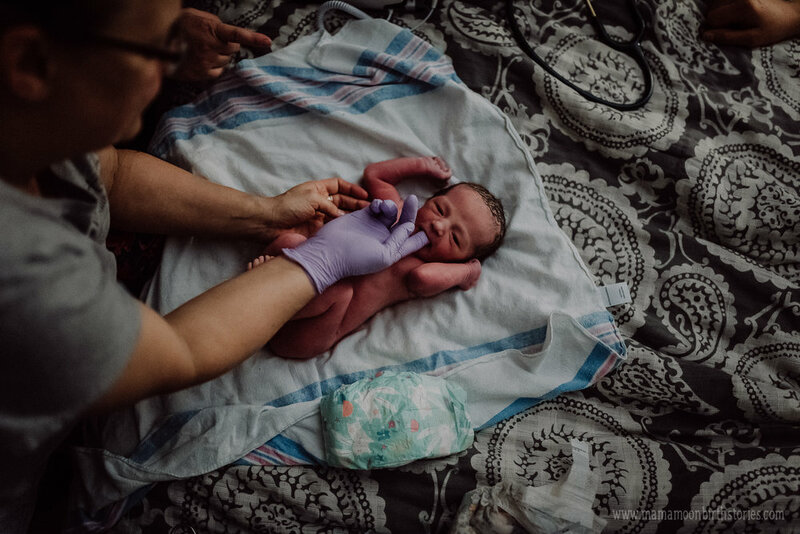 I said later that I cannot remember what was happening or more that I didn’t hear anything — All I saw was this baby, this breech birth in front of me and how to manage something I’d never managed or imagined. I’ll stop for a minute here. In 1994 I read a book that changed my life. It pushed me into childbirth and midwifery and it planted a seed that has waited and waited for Spring. The author had a footling breech at home and she did nothing. Her body did all the work. She’d dreamed the birth and so she followed her gut. As this little girl birthed to her waist and kicked, I thought, do nothing, be patient, just support. Be calm, don’t let Mama know anything is wrong. But I hadn't dreamt this birth. Funny how when words float out in front of you you instantly regret them. Of course I wasn't fooling anyone, especially not the birthing mother! I asked for a bulb syringe. I thought hours must have passed and why the hell wasn't anyone else walking through the door to rescue me? As the muscle tone slipped ever so slightly from the baby’s legs I knew I had to do something, that if this was the omen, I’d give up the midwifery path. I knew breech babies are almost always stunned and sometimes need extra help. I had no help; it seemed as if time had stopped and no one was ever coming. I asked for someone to call 911 and I told Mama we needed to birth her baby. She instantly raised a leg in the tiny bathroom, opening her pelvis more as I slid a few fingers in to work with her push, gently on the legs with my left and my right fingers guiding down on the shoulder (I think!) as she gave a great push and then she was born. I rubbed her with the towel as Mama sat down and reached for her. Her eyes were opening and she was gurgling. As I went to suction as my team came running in. I think I almost threw the bulb syringe, so startled at their entrance and what had just happened. There was a great commotion. At least I think so, that’s when I begin hearing what everyone was saying. That sweet lustful cry was the best sound ever. It’s been a few weeks and yet I’m still puzzled by the events—like birth Big Lebowski style. I’ve heard the story is making it’s way around town and some very flattering things have been said. Thank you. But know this. God totally set me up. I think He wanted me to commit, heart and soul and not just in action and deed. He knew somehow that I needed to stop doubting. To carry this thing with me as I collapsed from exhaustion, to know I won’t crack even when I’m breaking from all the hats I wear. And that midwifery isn’t my choice, has never been. He’d been patient and pulling me along for decades and now it was time to woman up and do the work. Never doubt He is saving you from yourself All.The.Time. How could anything be more aligned? 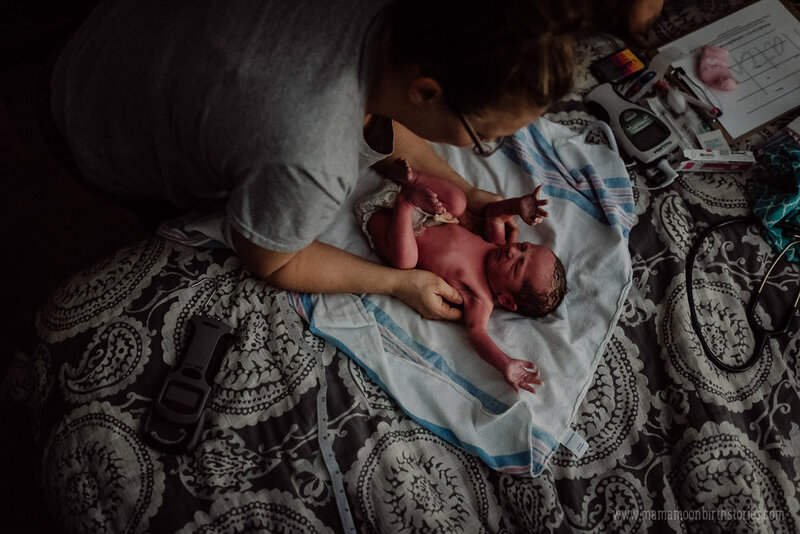 A birth photographer’s first catch is documented by a birth photographer and it’s a surprise breech? Alyse and baby Kennedy, for being ROCKSTARS.